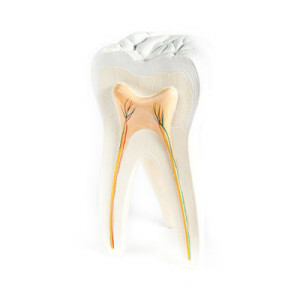 Root canal therapy becomes necessary when the inner nerve of a tooth becomes affected by decay, cracks, or infection. When this happens, the tooth may become extremely sensitive to both pressure and temperature, and intense pain can be expected. In the initial stages of decay and infection, it is possible that no symptoms would be present. However, in the advanced stages of decay and infection an abscess (bump-like inflammation on the gums) will form. When treating this type of decay or infection, the patient has two options: remove the affected tooth or save the tooth through root canal therapy. Extracting a decayed or infected tooth may result in significant and costly dental treatment to replace the missing tooth. Root canal therapy is a successful alternative to tooth removal, as it can provide full functionality to the tooth and mouth. Please contact us if you want to know more about this treatment, or want to schedule an appointment.